The BBC has released full details of how viewers can enjoy extra action from Wimbledon, Glastonbury and the Commonwealth Games via the BBC's Red Button service on Freeview, Freesat, Sky, Virgin Media and YouView. For Freeview and YouView viewers, some other services will be temporarily affected as a result of the changes. The details were released by Garazi Gola, the BBC's acting Director of Distribution. CBBC HD off air from 16th July until after the Games. 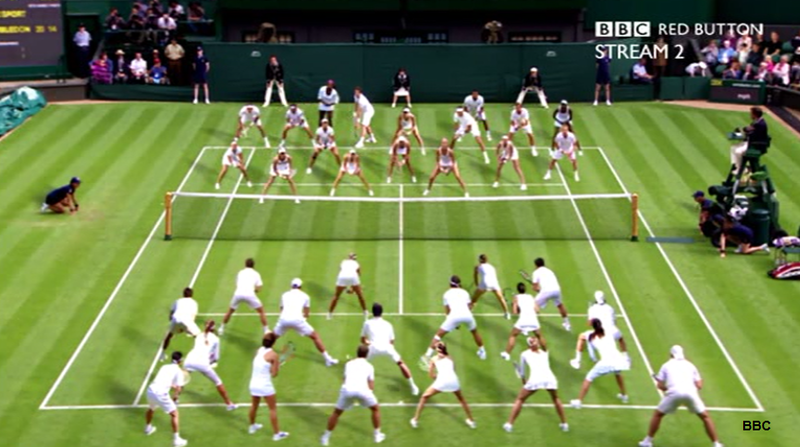 Both channels will run for 24 hours during Wimbledon and Glastonbury. During the Commonwealth Games, the BBC Red Button service on channel 301 will become part-time, available from 1900-0530. This is because the service will be timesharing with CBBC as BBC Three will be going full time for the Games. Unlike previous events, such as the 2012 Olympics, the BBC can't turn off BBC Parliament during the Commonwealth Games to allow other services to expand, as Parliament will not yet be in recess when the Games coverage starts. In Scotland, BBC Radio 4, 4 extra, BBC Radio 5 Live Sports Extra, BBC Asian Network and BBC Radio Scotland will be taken off-air during the evenings when BBC Alba is on air. This is to allow the BBC to cater for the extra Commonwealth Games coverage, when it is likely they will be changing bitrate allocations for the channels. The move takes place on the 16th July until after the Games, and temporarily reverses the changes that took place in December to Freeview radio in Scotland. Viewers with selected connected smart TVs with the BBC's Connected Red Button will be able to watch extra coverage from Glastonbury. Smart TVs with the BBC Sport App will be able to provide extra coverage from Wimbledon and Commonwealth Games via broadband internet (2-2.5Mbps minimum speed). BBC Red Button to be available on Sky and Freesat from channel 980 during Commonwealth Games. One HD stream from 23rd June, on Sky and Freesat channel 986. CBBC HD moves to temporary frequency for the Commonwealth Games. To make all of this extra coverage possible, the BBC has obtained an extra satellite transponder to broadcast the services until early August. CBBC HD will shortly switch to this new transponder to allow BBC Three HD to go full time in July for the Commonwealth Games. On Sky and Freesat, the Electronic Programme Guide used by receivers will be updated, so that viewers shouldn't need to do anything. Viewers who do have problems should switch off their receivers for 30 seconds and retry accessing the services. BBC Red Button HD makes a return this summer on satellite, where it will be a timeshare service with CBBC HD, during late July and early August. A part-time BBC Red Button service - called BBC RB0 - will launch on Sky and Freesat channel 980 for the Commonwealth Games, available from 1900-0530. Viewers with Freesat Freetime receivers connected to a broadband internet connection will be able to watch additional streams of Wimbledon and Commonwealth Games coverage via the BBC Sport App. Do you need to manually tune in BBC services? BBC channels on satellite: manual tuning details ► European viewers should note that the extra Red Button streams are on the UK spotbeam, and coverage beyond the UK and neighbouring countries is limited. All BBC Red Button streams, including HD on channel 996 are available to Virgin Media viewers. Viewers with TiVO are able to access additional streams via the BBC's Connected Red Button service. So it appears that YouView will not be getting Connected Red Button in the near future. "...and of course we will be the first platform to have the new BBC Red Button Services before the World Cup" ! Parliament goes into recess on the 22nd, the games begin on the 23rd - no reason at all BBC Parliament couldn't be used from the 24th onwards. The technical changes and apparent subsequent lock down are happening on 16th July, a week before Parliament goes into recess. The BBC could have rented a slot on some other TP for a few weeks for BBC Parliament. This could have run from say the 8th July till the 22nd of July on the EPG and then gone off air. Then from the 8th till the 16th the BBC could reconfigure the normal BBC Parliament slot, which could then have become CBBC during the day. Then the spare slot on 10773 H for a normal SD red button stream. Of course this would have meant that an extra slot would have had to be rented which would have cost. Or alternatively use the current BBC Parliament slot by creating a small part time 1 hour RB 0 slot during the night on the 8th July. Then on the 23rd instead of switching back to BBC parliament after the hour of red button, just leave the red button up and leave BBC Parliament off. The only change would be in the playout which would happen with the BBC only. Well, a week into the World Cup and still no connected red button on BT Vision as promised. Surely BT and Talk Talk customers shouldn't miss out on the action? Can't they dedicate an internet channel in their EPG to some of these coverage changes? A lockdown on the 16th shouldn't make any difference - they can just put the relevant channel number (303 presumably) ready and switch the feed on the 24th July. Simple. Similarly don't understand why CBBC HD has to go off-air a week before the games. It's not like BBC3 will be able to use the space for non-games content - they told themserlves off for that when they did it prior to the Olympics. @Brekkie I agree the changes they will make will be a back end thing at the playout presumably, so if its just a case of switching MHEG slates around whats the issue with the 16th being a lockdown for changes? and similar on Dsat for BBC Parliament. BBC Sport channel app on Skys "Now Tv" box. Comments for this article are now closed.